Cheese melting on top of warm popcorn. My cousin is a chef. Yes, she can debone a rabbit and braise onions for hours but those skills pale when I think of the gift she gave me one night when no one wanted to cook. She suggested cheesy popcorn. “Cheesy popcorn? What is cheesy popcorn?” I asked, eyes wide. I love popcorn and I love cheese and the two together struck me as an excess of riches. “I will show you.” And 15 years ago, show me she did. It is still my favorite dinner when the day has been long and drawn out, the creative cooking juices at their lowest ebb. It takes 10 minutes to prepare, it is super easy, and the quality of the final product rests on one thing – how much good cheese you want to grate. There are recipes online and products available that make this easy for you. Cabot makes a powdered cheddar cheese that apparently sticks very well to popcorn when you spray the popcorn with a butter spray. That is not the recipe I learned. The recipe I learned involves popping the popcorn on the stove top in oil and butter, finely grating a good swiss cheese (if you want to splurge, Comte or Appenzeller are divine), and allowing the cheese to melt onto the popcorn so that when you pick up a piece there are strings of warm cheese stuck to the corn. It is mouthwatering and very satisfying. 1. Cover the bottom of your pot with a layer of oil, drop in butter, and sprinkle in salt (that way the salt dissolves and coats all of the corn). 2. Put three kernels into the oil and put the lid on. 4. Once you hear the three kernels pop, pour in enough corn to be coated liberally with the oil. Put the lid back on. 5. Continue to grate. The more cheese you grate the more decadent your popcorn will be. Take a moment to shake the pot, return to grating. 6. After the corn has stopped popping, open the lid – a flash of steam and popcorn smell will envelope you as you sprinkle the delicate cheese onto the warm kernels. 7. 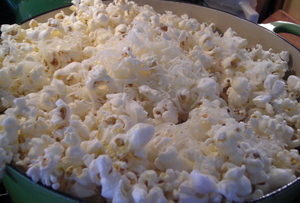 Put the lid back on and let sit while the cheese gently melts onto the kernels. Shake the pot gently to encourage the cheese to fall into the nooks and crannies. 8. Turn onto your big bowl and devour the simple meal. This entry was posted in In the Kitchen (recipes & more) and tagged Corinna Borden, Popcorn, Real Time Farms. Bookmark the permalink. 1 Response to Have You Tried: Cheesy Popcorn? I used to eat popcorn as a “supper” all the time when I was in college–a few years ago!–and haven’t eaten it like that in awhile. This recipe reminds me of those days and of a tradition that needs to be recovered! !